If you have decided on an invitation-only event, then you need to think about creating your invitations and how to use them to draw people to your special occasion. If your event is being staged to celebrate a private occasion, be it personal or simply exclusive, then guests will likely need to be invited by invitation. This should include all the essential information and make the event appear to be one not to miss. The invitation should minimise the effort needed on the part of the invitee to book a place and attend the event. The more complicated it is to attend the event, the more effort the invitation should make. For instance if the venue is in a more obscure location away from major transport links then the invitation could include a map with directions from the main approaches. If the location makes it more difficult for guests to return home the same evening then a list of local hotels could be included as well. Choosing between email and paper invitations can be difficult because they each have their own distinct advantages. Email has enabled the developed world communicate with efficiency and ease. One of its more minor claims is in revolutionising event invitations. Organisers no longer need to spend great time and money sending paper invitations, now that email can do the job much more efficiently. Email invitations not only perform better than their paper cousins, they are able to do more as well. For instance if your event features music then the invite could feature weblinks to the band’s website or myspace page, so that you can a get feel of the music before you decide to attend. If you particularly web savvy then you create a website for your event, featuring more in depth event info, and then include a link to it in your invite. Emails may be efficient, but paper invites are special. With the email having taken over personal communication across the developed world, receiving a letter through the post has become an increasingly rare occurrence. A consequence of this is that a personal letter has become a cherished thing. It shows that instead of knocking off a group email in five minutes, the sender has chosen to take the time and care to sit down to write a personal correspondence. Therefore if an event organiser has taken the trouble to send a personal invitation then the impression created is that they must really want the invitee to attend. In fact it would almost seem rude not to attend, at least not without sending a RSVP. Factors such as budget, time, taste and the type of event and audience will ultimately determine whether you choose paper or email invites for your event. 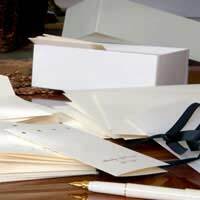 Generally email is the invite of choice these days, with paper invites being reserved for those occasions where aspects like tradition, splendour and the personal touch are particularly valued. It is important to think carefully about the design of the invite. If it is naff then what will the event be like? Consider the mood of the occasion – is it formal or casual, fun or trendy? If it is a formal event then it is probably best to stick with an understated and elegant design, and seek out professional help. If it is a fun event then something more charming and homemade could work. It is getting easier and easier for anybody to use a computer to create invitations. The trick is to keep your designs simple – don’t feature a mix of typefaces and lots of awkward small images otherwise it will likely look like a muddled mess.